Lorraine Jones yearned for a beautiful kitchen which balanced classical tones whilst also keeping a light feel. Her 1930's, 4-bedroomed home in Essex, which she shares with her husband John and teenage daughter Erica, demanded a traditional kitchen but with concise lines and form to help keep it in line with the light and simplistic aesthetic of the homes' interior. Lorraine told Broadway Kitchens: "I'm not keen on ultra-modern, high-gloss kitchens and frankly, I think such a style would have just looked wrong in our period home. However, I didn’t want a design that was too ornate or over-fussy either. We really wanted a design that was clean and light in tone to reflect the abundance of daylight that floods into our conservatory: the extension that houses the kitchen. It also had to be practical with plenty of storage and worktop area whilst doubling up as a sociable space." The ‘Art and Crafts’ theme that Lorraine has created throughout the Jones’ home successfully marries her contemporary styling tastes to the subtle, Edwardian architectural features of the building. Working with Lorraine, Broadway Kitchens aimed to keep this style consistently flowing throughout the home and into their new open-plan conservatory kitchen. 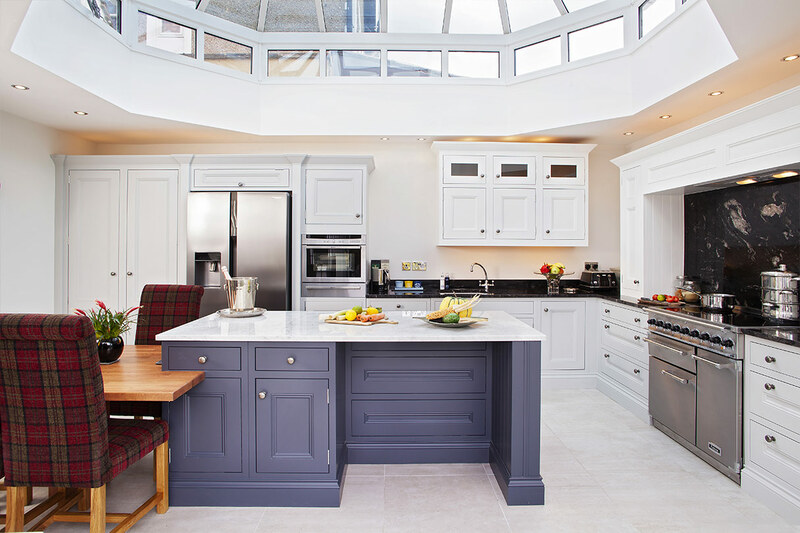 This was achieved though handmade Shaker-style cabinetry which shows a very pure, in-frame kitchen design, which was then created and hand-painted in three cosy and complementary colour shades. 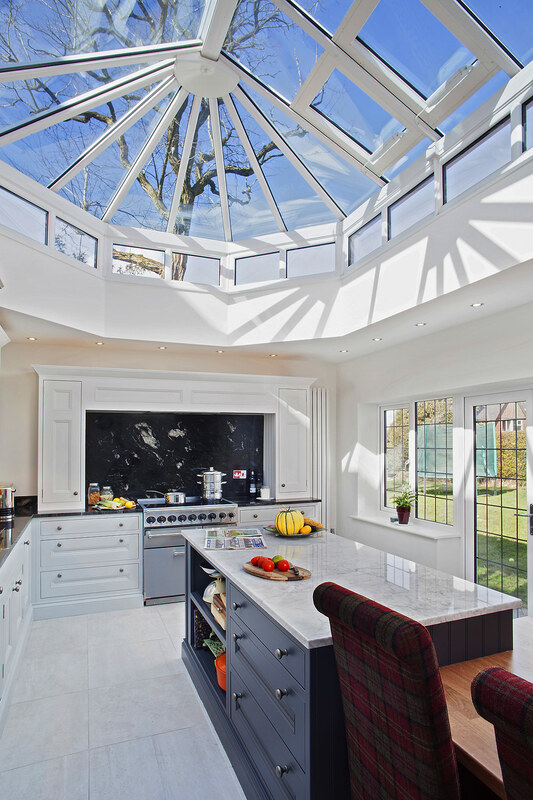 Framed perfectly by the conservatory’s orangery-style glazed ceiling and French-style doors which draw you into the garden, is a multi-function island and the focal point of the kitchen. This island provides informal dining via a breakfast bar, where one can simply swivel around and take in the views of the garden, as well as a neatly integrated natural oak table set at a lower height to accommodates more friends and family. Perfect for those leisurely Sunday breakfasts. The island isn’t just lovely to look at. Plenty of storage has been provided with several cupboards, oak dovetailed drawers and shelve space for cookery books and knick-knacks. The vast, stretching plain of Carrera marble worktop provides plenty of food preparation space and strikes a cool contrast to the Charcoal, hand-painted finish of the island’s underneath. Aesthetically pleasing, contrasting finishes are juxtaposed with the wall furniture. 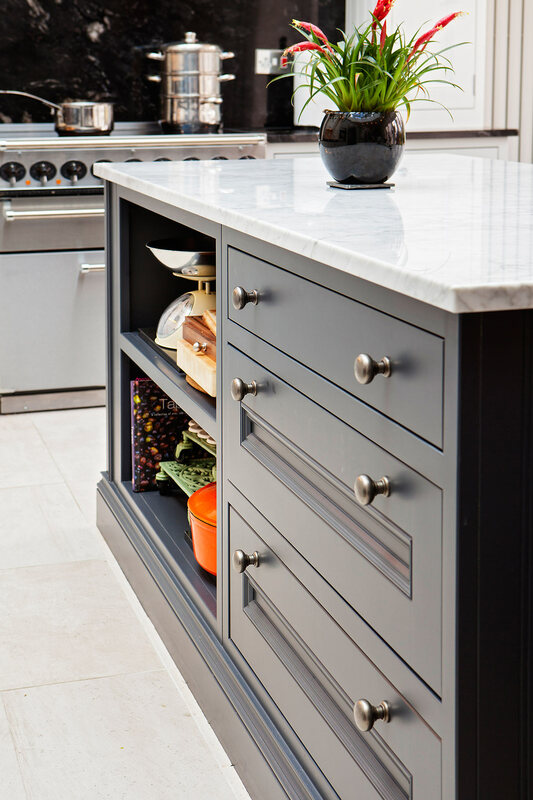 The hand-painted, ‘Dove Grey’ base cabinets work wonderfully well with the 'Cosmic Black' granite worktops. Once again, practicality is at the forefront of this design, with the base and tower cabinet arrangement providing the perfect working triangle to minimise unnecessary movement whilst cooking. The large double door larder unit, which is big enough to act as a food and ingredient store for the entire family, sits next to the large ‘American’ style fridge freezer, which is in turn adjacent to the integrated ovens, warming drawer and kitchen sink. On the opposite side of the sink and on the return wall is a stainless steel, free-standing range cooker with an ultra-efficient, induction hob. Now, upon entering the kitchen from the open-plan living room, your eyes are immediately drawn to the eye-catching island and then drawn beyond to the impressively long mantel, framing the range cooker and ample drawer storage. Painted in 'All White' as with the partially glazed wall cabinets, the finish gives a step lighter, tonal change from the base cabinets which helps to define the mantel. Lorraine sums up the finished product perfectly; “I love how Broadway’s designer, Satt, was able to work the shape of the room, producing custom-made furniture that’s beautifully in proportion with the architectural shape and dimensions; I don’t think ‘off-the-shelf’ furniture would have worked nearly as well. I also think the 'fusion' of traditional and contemporary kitchen styling hits the perfect balance between detail and simplicity”. What do you think? Can you imagine this Broadway Kitchen being part of your home?